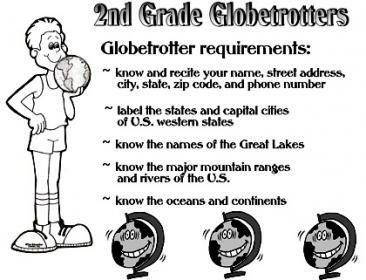 Below is the list of requirements for the 2nd Grade Globetrotters Social Studies Award at Roger Gehring Elementary School. Each student has the opportunity to receive this award. The research for the answers must be done at home by the student with minimal help from parents. Once a student has mastered (at home) something on the list then they will be tested on it in class. They can try as many times as it takes to pass. Students do not have to do all of them at once, they can master each one as they learn it. As a parent, please make sure you are sending your child to school when you feel that they are ready. In fact, you can send a note with your child to let me know what they are ready to do. Students may do one thing at a time on the list. All requirements must be met by Spring Break (the first week in April 2012). We must stick to this date due to the fact that it takes time to order the plaques for the students. The plaques will be issued at the very last awards ceremony of the school year. I have the actual practice sheets in a PDF file below for downloading. Know the major mountain ranges and rivers of the U.S.